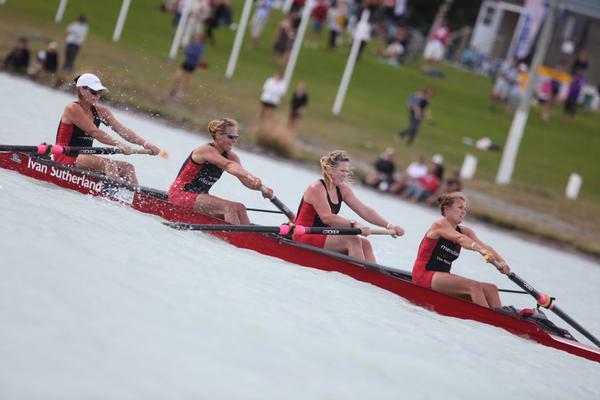 Southern RPC showed real class in straight fours at the 2011 BankLink New Zealand Rowing Championships at Lake Ruataniwha today - taking the two top titles. On an afternoon disrupted by blustery conditions, the women's four of Lucy Spoors, Genevieve Behrent, Alex Burnside and Jess Lowe turned on the style to out row Central RPC's crew containing world champion Rebecca Scown and a very experienced Waikato crew in tricky headwind conditions. Moments later Southern's men - Hamish Bond, Jade Uru, John Storey and Carl Meyer - turned over the pre race favourites Central RPC and the Waikato RPC crew to take a second impressive gold medal for the Southern squad. It was the second premier win of the day for Bond and Uru after they beat Eric Murray and David Eade in the top pairs’ event. It capped a superb afternoon for the Southern RPC squad with Matthew Trott and double scull world champion Nathan Cohen retaining their title in a good race against Joseph Sullivan and Robbie Manson of Central RPC, but the race waited an eternity to get underway after an apparent equipment failure from the Auckland crew of Mahe Drysdale and Pete Taylor. The validity of this was tested after the race when winner Cohen protested Auckland's third place, but Auckland were never in the race anyway and finished some way behind the two crews containing New Zealand's newest sculling world champions. Fi Paterson and Anna Reymer, who would have been the selected crew at the Karapiro world champs had Reymer not picked up an injury, dominated the women's premier double scull. Completing a good day for the South Island, the Rowers2Rio athletes being nurtured by former world champion Nicky Coles impressed, with the women securing a win in the novice eight for Avon ahead of an attempt at the club and senior titles and the men forming (a very tall) part of the winning Avon’s men's novice eight. For a group who have rowed less than a year and who are inevitably light on race experience and knowledge, it was a mighty impressive result and proved the Rowing New Zealand programme was producing some early and promising results.